Play Pack including delivery with on going monthly subscription for $39.95 a month for 11 months, cancel anytime, no lock in contracts. 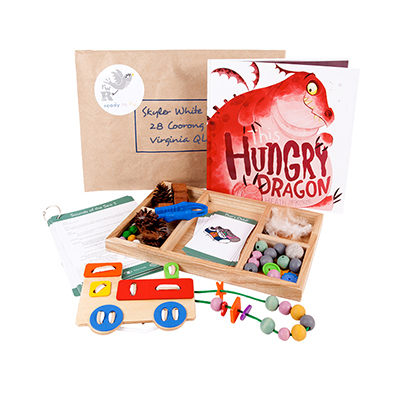 Sign up for our Play Pack subscription and you’ll receive the unique Play Date resources and professional tools delivered straight to your door every month. Subscription requires resources from Starter Pack 1. Click to purchase our Starter Pack. Accompanying your packs, will be an informative web content that will allow you to access video tutorials, on any device, from Corinne and Kerri. The videos will provide you with the knowledge and tools to engage your child in meaningful play that will lay the foundations for their success through a holistic, engaging and fun approach to learning in their home environment. The Read Write Ready subscription will also allow you access to the RWR community web page which contains these resources and will provide continual information sharing and practical ways you can assist your kids. New activities delivered monthly will keep your child engaged and are designed to challenge them and build their confidence as they progress through our program. Ours is a positive and collaborative community, where all are welcome to share their experiences and assist other parents and carers on their RWR journey. Cancel any time, no obligation purchase. Join us today and get your little one ready to fly! Monthly subscription fees will be billed on the 17th of each month with packs despatched on the 20th of each month.